3Department of Internal Medicine, Ali Ebne Abitaleb Hospital, Zahedan University of Medical Sciences, Zahedan, Iran. Rheumatoid arthritis has a non-homogeneous pattern around the world. The current study aimed to describe the clinical manifestations and disease activity of rheumatoid arthritis patients in southeastern Iran. 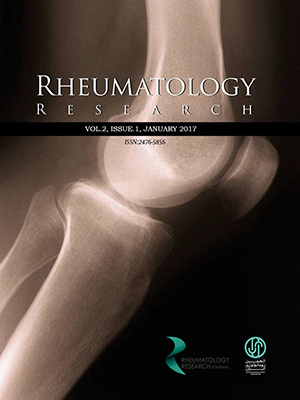 In this descriptive, cross-sectional study with convenience sampling, data regarding the demographics, painful joints, number of swollen and tender joints, ESR, disease activity, and therapeutic regimen of 500 patients with rheumatoid arthritis who referred to the Rheumatology Clinic of Ali Ebn Abitaleb Hospital between October 2012 and October 2013 was collected using a data form. After collection, the data was analyzed using SPSS version 16. Of the 500 studied cases, 437 cases (87.4%) were female and 63 cases (12.6%) were male. Average patient age was 48.78 ± 13.97 years, and the mean duration of the disease was 7.28 ± 7.14 years. The mean value of disease activity score-28 (DAS-28) was 3.54 ± 1.38. The DAS-28 in 30.25% of cases was below 2.6, while in 14.7% of cases it was greater than 5.1. The knee (49.6%) and the wrist (36.6%) were the most prevalent painful joints, and 375 patients complained of morning stiffness. The most frequent therapeutic regimens were prednisolone (81%), methotrexate (62.4%), hydroxychloroquine(60.8%), sulfasalazine (24%), and non-steroidal anti-inflammatory drugs (NSAIDs) (22.2%). Based on the results of this study, the mean value of DAS-28 of 3.54 ± 1.38 implies disease activity in most cases in southeastern Iran. This indicates that changing therapy regimens is necessary. 1. Sokka T, Kautiainen H, Toloza S, Mäkinen H, Verstappen SM, Hetland ML, et al. QUEST-RA: quantitative clinical assessment of patients with rheumatoid arthritis seen in standard rheumatology care in 15 countries. Annals of the Rheumatic Diseases 2007; 66(11): 1491-6. doi: 10.1136/ard. 2006.069252. 2. Thyberg I, Dahlström Ö, Björk M, Arvidsson P, Thyberg M. Potential of the HAQ score as clinical indicator suggesting comprehensive multidisciplinary assessments: the Swedish TIRA cohort 8 years after diagnosis of RA. Clinical Rheumatology 2012; 31(5): 775-83. doi: 10.1007/s10067-02101937-0. 3. Sany J, Bourgeois P, Saraux A, Durieux S, Lafuma A, Daures J, et al. Characteristics of patients with rheumatoid arthritis in France: a study of 1109 patients managed by hospital based rheumatologists. Annals of the Rheumatic Diseases 2004; 63(10): 1235-40. doi: 10.1136/ard.2003.013110. 4. Kobak S. Demographic, clinical, and serological features of Turkish patients with rheumatoid arthritis: evaluation of 165 patients. Clinical Rheumatology 2011; 30(6): 843-7. doi: 10.1007/s10067-011-1678-5. 5. Mota LMHd, Neto S, Burlingame R, Ménard HA, Laurindo IMM. Laboratory characteristics of a cohort of patients with early rheumatoid arthritis. Revista Brasileira de Reumatologia 2010; 50(4): 375-80. doi: 10.1590/s0482-50042010000400004. 6. Teh C, Wong J. The pattern and clinical manifestations of rheumatoid arthritis in Sarawak General Hospital. Clinical Rheumatology 2008; 27(11): 1437-40. doi: 10.1007/s10067-008-0945-6. 7. Lutf A, Poil AR, Hammoudeh M. Characteristics of patients with rheumatoid arthritis in Qatar: a cross‐sectional study. International J of Rheumatic Diseases 2014; 17(1): 63-5. doi: 10.1111/1756-185x.12135. 8. Erdes S, Alekseeva L, Krylov M, Kariakin A, Benevolenskaia L. [The prevalence of rheumatoid arthritis and the rheumatoid factor in the native inhabitants of northeastern Siberia]. Terapevticheskii Arkhiv 1998; 71(5): 9-12. 9. Davatchi F, Akbarian M, Shahram F, Nadji A, Gharibdoost F, Jamshidi AR. DMARD combination therapy in rheumatoid arthritis: 5‐year follow‐up results in a daily practice setting. APLAR Journal of Rheumatology 2006; 9(1): 60-3. doi: 10.1111/j.1479-8077.2006. 00166.x. 10. Mobini M. Probable risk factors of rheumatoid arthritis, a case control study. Journal of Mazandaran University of Medical Sciences 2010; 20(75): 38-44. 11. Lee DM WM. Rheumatoid arthritis. Lancet 2001. 12. Badsha H, Kong KO, Tak PP. Rheumatoid arthritis in the United Arab Emirates. Clinical Rheumatology 2008; 27(6): 739-42. doi: 10.1007/s10067-007-0782-z. 13. Slimani S, Abbas A, Ammar AB, Kebaili D, Rahal F, Khamari MC, et al. Characteristics of rheumatoid arthritis in Algeria: a multicenter study. Rheumatology International 2014; 34(9): 1235-9. doi: 10.1007/s00296-014-2981-7. 14. Albers J, Paimela L, Kurki P, Eberhardt K, Emery P, van‘t Hof M, et al. Treatment strategy, disease activity, and outcome in four cohorts of patients with early rheumatoid arthritis. Annals of the Rheumatic Diseases 2001; 60(5): 453-8. doi: 10.1136/ard. 60.5.453. 15. Estel BAP ML, Wojdyla D, Acevedo E, Laurindo IMM, Guibert ZM. Is there something we can learn from rheumatoid arthritis in Latin America? A descriptive report on an inception Cohort of 1093 patients Ann Rheum Dis 2008; 67. 16. Bengtsson C, Nordmark B, Klareskog L, Lundberg I, Alfredsson L. Socioeconomic status and the risk of developing rheumatoid arthritis: results from the Swedish EIRA study. Annals of the Rheumatic Diseases 2005; 64(11): 1588-94. doi: 10.1136/ard.2004.031666. 17. Pedersen M, Jacobsen S, Klarlund M, Frisch M. Socioeconomic status and risk of rheumatoid arthritis: a Danish case-control study. The Journal of Rheumatology 2006; 33(6): 1069-74.